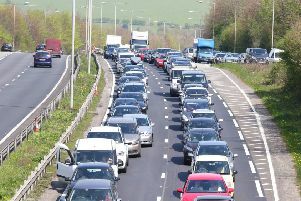 Sussex Police has given an update on the broken down lorry which has caused major traffic delays. As previously reported, the HGV vehicle broke down on the High Street roundabout in Shoreham this morning. A Sussex Police spokesperson said: “At around 10am on Wednesday (27 July) a lorry broke down on the A259 outside the Bridge Hotel, High Street, Shoreham, causing significant disruption to local traffic.